What is this plant in our new home? Large green rosettes with rounded burgundy edges. Large (18") yellow flower spike. Over 7' tall. How does it propagate? This is the most gorgeous, and fleeting of all plants you could ever be fortunate enough to have. 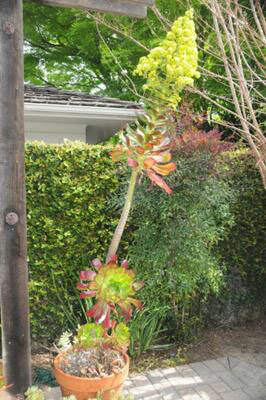 It's one of the Aeonium, and as it's blooming, the rosette will die, leaving behind (with luck) some young chicks around the base of the stalk. These can be relocated, or left to make a colony. The rosettes bloom only once, after growing for several years. If you have the propagating gene, sometimes the seeds will germinate, but that's a long term proposition. 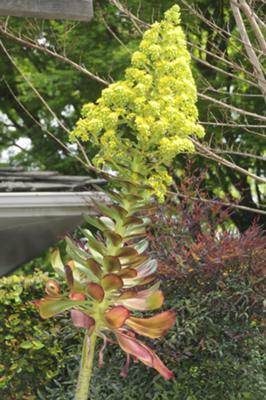 In the picture showing the full height of this wonderful plant there are some rosettes growing lower down which will take over as the lead plant once the flower stalk is cut down (after it finishes blooming, of course). What a lucky break for you! Congratulations on your new home, and your gorgeous plant!